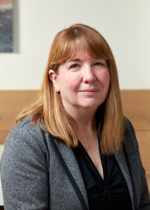 Lucy joined the Foundation in 2008 as Director of Finance and Resources having fulfilled similar roles for Church Urban Fund and the Institute of Education, University of London. She studied social policy at university and holds a BA from the University of Kent and an MSc from the London School of Economics. On leaving university she worked in various roles in the voluntary and not for profit sector and became a member of the Chartered Institute of Management Accountants. Lucy also holds the Institute of Chartered Accountant’s Diploma in Charity Accountancy and is qualified coach.